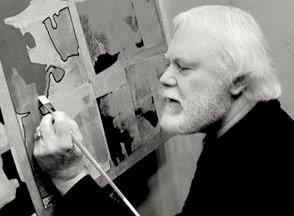 In his art, Ron Scolastico combines painterly forms and structural elements to create a new synthesis. Borrowing a term from architecture, he calls this work, Structural Expressionism. Scolastico’s art can be linked to both the Abstract Expressionists and the Hard Edge painters of the 1960s and 70s. Drawing upon those two diverse styles, his paintings set the turbulence of organic, gestural forms against the control and order of geometric elements. Scolastico began his career as an artist in 1968 while a student at the University of California at Berkeley where he began to make political protest paintings done in the Surrealist style. Then, sparked by his admiration for the work of Robert Motherwell, Willem de Kooning, Jasper Johns, and Richard Diebenkorn, he began to explore pure abstraction. He later initiated his first experiments in Structural Expressionism by working with intricate combinations of vertical planes. Now, he combines the vertical planes with an interplay between his active organic shapes and the precise geometric elements. He often incorporates metallic colors, along with gold, silver, and copper leaf to add vigor and vitality to his paintings. 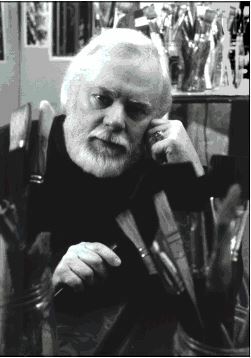 During his lifetime, Scolastico’s work was widely exhibited in the United States and abroad. It can be found in the homes and offices of numerous private collectors. In 1999, Scolastico's art was selected for inclusion in the historic Salon d’Automne in Paris. Established in 1903, the Salon has been an important venue for presenting the work of artists such as Picasso, Matisse, Gauguin, and many modern painters during their lifetimes. 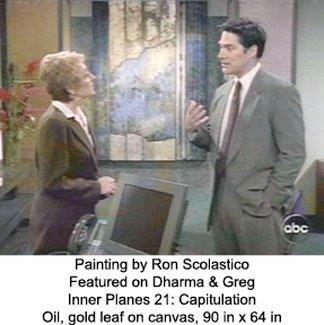 Ron's paintings have appeared on numerous television shows and movies including, "Lie to Me," "Monk," "Dharma and Greg," "CSI," "Parenthood," and many others. Shown on the TV series, "Lie to Me."